In their importance to Chinese culture ceramics are comparable with secular sculpture in the West. 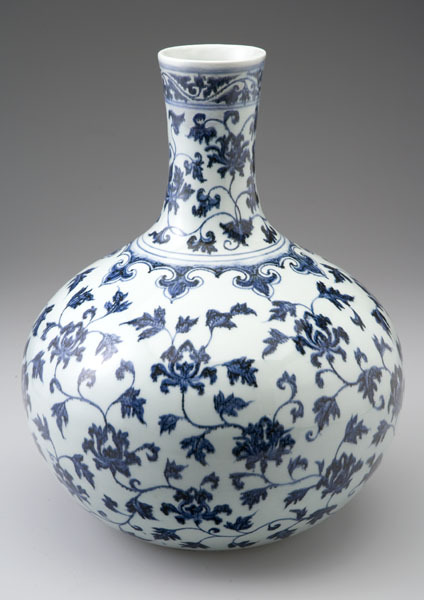 The most influential ceramic type in history, Ming underglaze-blue decorated porcelain was exported from China to Southeast Asia and to Europe and was carried in Arab ships throughout the Islamic world. 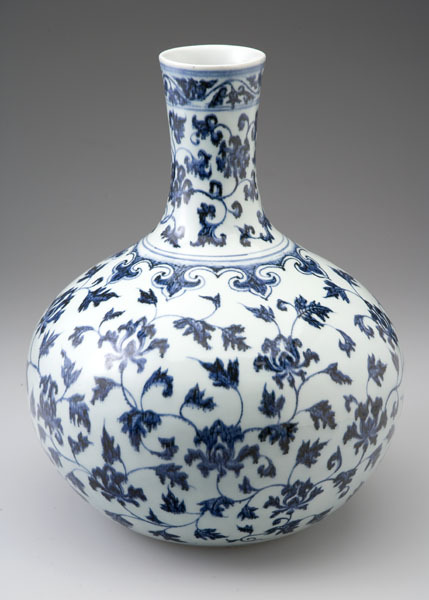 This vase, painted all over with peonies in a leafy scroll, is characteristic of the outstanding blue-and-white ceramics manufactured under imperial patronage at the Jingdezhen kilns in the early Ming dynasty. Its quality identifies it as an object created for refined Chinese taste and not for export. In addition to the painting, which shows great sensitivity in line and shading, the technical process contributed to the depth and richness of the surface. Sometime during firing, the cobalt blue pigment "heaped and piled," creating small, dark dots; at other times the pigment ran. Both of these accidental circumstances enliven the piece with tonal variations and painterly effects.